Cleaner/Polish. 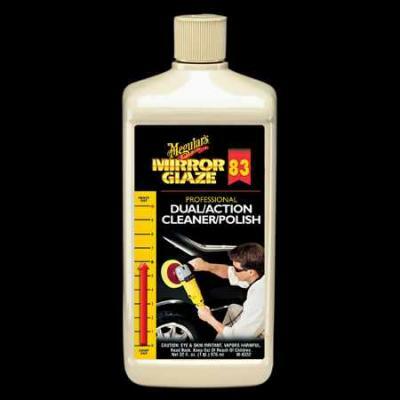 Dual Action Cleaner/Polish removes light to medium oxidation that Swirl Free Polish, M82, will not. Combines the perfect amount of abrasive cleaner and pure, rich polish to produce a customer pleasing deep gloss shine. Safe, Buffered Abrasive� cleaning removes defects without marring the finish. Use with a medium grade foam pad. Dual Action Cleaner/Polish removes light to medium contamination, blemishes and oxidation that M82, Swirl Free Polish will not. Combines the perfect amount of abrasive cleaner and pure, rich polish to produce a customer pleasing deep gloss shine. Safe, Buffered Abrasive™ cleaning removes defects without marring the finish.